There currently are three banners in the Out of Our Minds range with images of lions on them. These are "The Lion and The Lamb," "The Lion of Judah Resting" and "The Lion of Judah Roaring." This banner represents the yearning for the new heaven and new earth and the surety that they are on their way and will be ! rmly established. 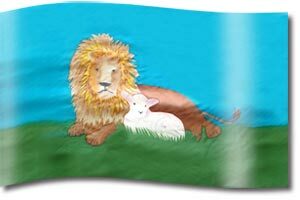 Isaiah 11:6-7 and 65:25 describe how the fierce powerful lion and the vulnerable, pure lamb will share space and "they will neither harm nor destroy on all My holy mountain, for the earth will be full of the knowledge of God as the waters cover the sea." The two images also represent two contrasting aspects of Jesus, both "The Lion of the Tribe of Judah" and the "Lamb of God." Whilst there are many different ways that lions are portrayed in Scripture, these banners refer to the images of Jesus as God. The allusions of lions are most often to its majesty and strength, indicative of royalty (Proverbs 30:30), its courage (Proverbs 28:1) and its fierceness (Psalm 22:13). The Lamb was often used as a sin offering in the Old Testament for example in Leviticus 3:6, 4:32. In John 1:29 and 36 in the New Testament, Jesus is introduced figuratively as the Lamb of God who takes away the sin of the world. In Revelation it is used of Jesus 28 times with reference to His nature and to His sacrifice. He is seen to be sharing sovereign glory and honour with His Father. The lamb imagery is often used to convey vulnerability as well as a worthy, pure sacrifice. (Isaiah 53:7, 1 Peter 1:19). Holy Mountain, Lamb, Lion, New Earth, New Heaven, Peace, Sacrifice, The Lamb of God, The Lion of Judah, The One God.